The military has a reputation for taking undisciplined recruits and turning them into highly disciplined men and women. Discipline and focus on the battle field can save your life. Similarly, good media training brings discipline to how you think and communicate in the workplace; it can provide the right boost for your team and career. In today’s tight job market, candidates with well-rounded communication skills are the hottest ticket going. In one Deloitte study 92% of leaders say their ability to stay competitive in a global economy depends on attracting more people with stronger communication and soft skills. 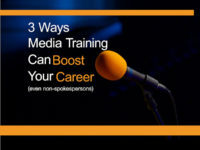 Media training forces you to rethink how you speak, write, manage objections and collaborate. It provides the structure and precise communication skills you need to be invaluable to your team. Media training helps team members sharpen their influence skills with internal and external audiences. The idea of media training for non-spokespersons first occurred to me when I received a call from a manager with a major USA manufacturing group. He had attended one of our media training workshops and wanted to book another media session for his company’s top twenty engineers. I was puzzled and asked, “Will they ever be media spokespersons?” He replied, “Absolutely not! But, I’ve used the media skills I learned in negotiations, regulatory hearings, customer meetings and to be a better leader.” On another occasion the vice president for an energy group called with a similar request. Her young team needed stronger skills convincing management to act on their recommendations for projects and other key initiatives. She had witnessed industry competitors taking her team’s ideas that management had rejected and making them successful. So, she asked us to customize media training to show her team how to more effectively frame their messages and stay on message even when their leaders challenged them with objections and pushback. Teams benefit from better messaging skills and strategies. A good media training program equips you with a wide range of messaging skills and communication strategies to tell your story quickly and accurately. You learn how to craft messages with just the right amount of data, color and empathy to make your story more appealing to reporters and other audiences. When we coach leaders to improve their speeches or presentations, we often discover they have “buried their lead.” This journalism term means you failed to put your most important information up front. 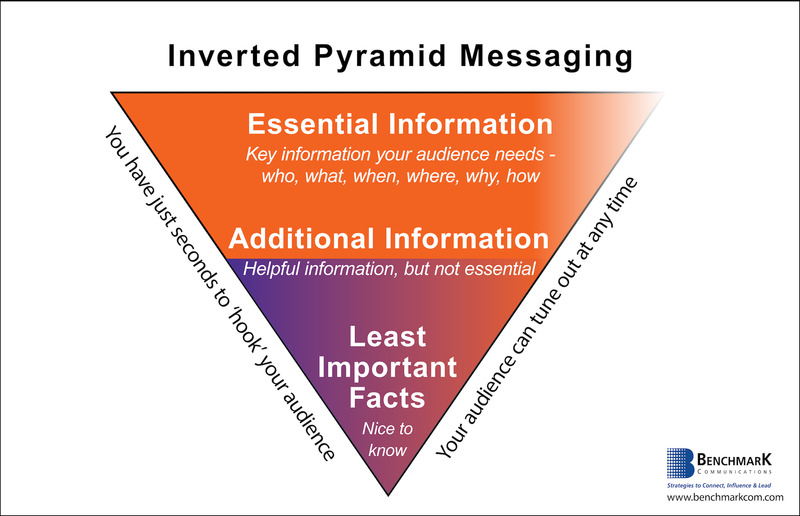 News reporters use what’s called the Inverted Pyramid to structure their stories. The Pyramid provides an easy method for stacking and prioritizing your information. It ensures your audience gets the most important information first, and this is important with shrinking attention spans. We recently created variations of the Inverted Pyramid to help a struggling young manager. His peers perceived him as rambling and unclear during conference calls and meetings. The Pyramid templates we created for him made an immediate difference. His credibility got a boost and he feels less stressed at work. News reporters also value people who know how to add color to make their stories more compelling. Journalists are dealing with shrinking news staffs, so a news source who offers up an assortment of storytelling elements is “gold” to them. The same is true with corporate presentations! When you are preparing to sell your projects and ideas, first brainstorm with others how you can add color to make your ideas more compelling and memorable. The “news hook” isn’t just for media stories – it is for anyone who wants to sell their ideas. Is this new or different? Is this part of an important trend? How will this solve a pressing problem? How is this a great opportunity? How will this make a real difference? Many people have valuable ideas, but they lack the communication skills necessary to clearly convey WHY their ideas are worthy of consideration or approval. Think of the “news hook” as a booster rocket that can propel your ideas deep into the minds and memories of others. The right news hook helps you “move the needle” in your quest to influence others. So, if you want to increase your credibility, be sure to brainstorm the best “news hooks” before presenting your ideas. Time is a valuable commodity within organizations, and you will earn greater respect when your ideas are more targeted and compelling. To be a leader, you must be better at thinking on your feet during Q&A. The best media spokespersons log many, many hours honing a range of vital soft skills – active listening, problem solving, nonverbal acuity and more. But, Q&A is where the rubber meets the road – and separates the good spokespersons from the great ones. A great spokesperson can quickly identify the type of question being hurled at them and make split-second decisions on the best way to respond. Some of my favorite spokespersons are truly communication nerds; they enjoy the rush of thinking on their feet. There are five primary types of questions that media spokespersons must be able to quickly identify and address: factual, leading, hearsay, speculative and off-track questions. Stronger Q&A skills are essential for selling ideas and projects. Of all the media skills required for success, listening skills are most crucial to nailing the media interview. A seasoned spokesperson hears what is at the heart of the reporter’s question. They learn to listen for a range of important elements embedded in each question: context, assumptions, perspectives, emotions, history and much more. Likewise, listening and Q&A skills are in great demand across teams and organizations. As you prepare for important presentations and meetings you should make a thorough list of all the possible questions you might get and plan your responses ahead of time. Often, it is how you respond to questions that earns you the nod to move forward with projects and ideas – or not! A worthwhile media training program is somewhat like a boot camp – you walk out as a much more disciplined and focused communicator. You gain skills that will serve you daily because you learn to think differently about messaging, perspectives, emotions, structure, color, Q&A preparation and much more. You will also watch news interviews with a whole new awareness and appreciation after going through a media training workshop. You realize that the very best spokespersons make it look easy! But, they are tapping a wide range of honed soft skills forged in fire over years. So, grab some media skills and jump into the fire of experience! It is fun and forever changes how you think about communicating and influencing others. Hello! If you found this story on LinkedIn, Twitter or Facebook, please consider “liking” it or sharing this information with others on those sites. We also invite you to leave a comment on our webpage and contact us for better media, communication & influence skills. If you would like to receive other tips to advance your skills and career, you will find the SUBSCRIBE button on the top, right hand side of this page. Benchmark Communications provides award-winning communication and soft skills strategies to help leaders & Fortune 500 groups achieve their business goals. We provide consulting, coaching and training services in: media strategies, leadership development, communication / soft skills, reputation management, stakeholder engagement and storytelling / presentations. Benchmark has consulted with and trained leaders and associates from all 50 USA states and more than 25 countries.